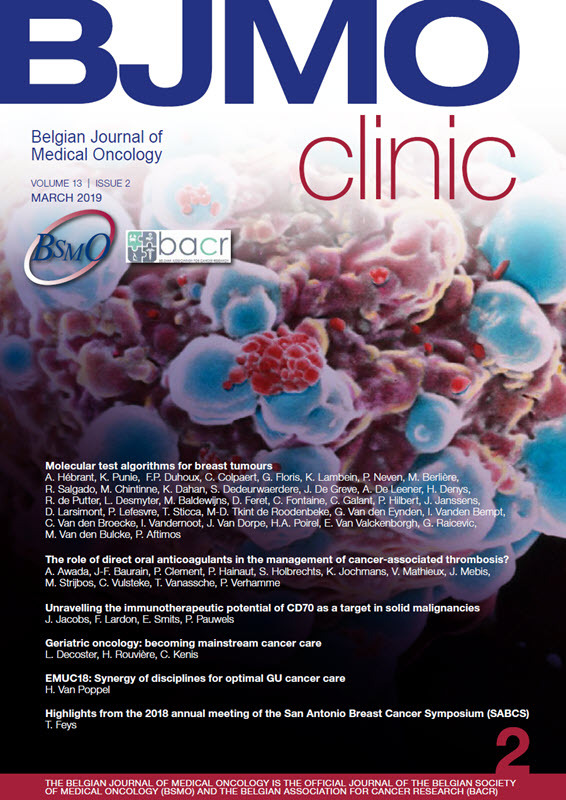 The Belgian Journal of Medical Oncology (BJMO) is the official journal of the Belgian Society of Medical Oncology (BSMO) and the Belgian Association for Cancer Research (BACR). BJMO is the journal for training of medical specialists working in the field of oncology, as well as radiotherapists, oncologic surgeons and other internal medicine specialists working in Oncology. BJMO is a practical and informative medical journal. The aim of the journal is to provide insight and overview of the latest medical developments. Through BJMO, one is informed quickly about the latest relevant developments for clinical practice in medical oncology and related fields. The content is compiled by an independent editorial board, written by medical specialists, and is peer-reviewed in order to warrant objective information. Of course, BJMO is open to contributions from readers. Spontaneous submissions can be published after review and approval by the editorial board. More information about submissions is available at Submission of manuscripts. These author instructions provide a detailed overview of the requirements for the different article types of the journal. If your manuscript contains photo’s, scans or videos of patients, please print and return this form of written consent to us after it has been signed by both the patient and yourself as author of the manuscript. All authors of an article need to sign the copyright form. Do you have questions, remarks or do you like to receive more information? Ariez is a medical publisher specialised in high-quality, up-to-date training & refresher courses for doctors. We strive to improve healthcare by improving the skills of doctors.